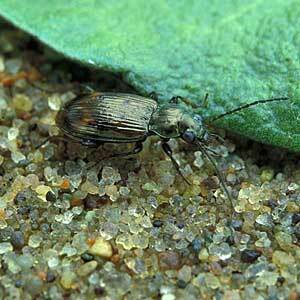 Description: 5-6mm long bronze and yellow-patterned ground beetle of sandy fens and riverbanks. Widespread but local. World Distribution: A Eurasian Boreo-temperate species (55) distributed across Europe to eastern Siberia. Irish Status: Very scattered. Mostly in the east and south. Ecology: Thermophilic on sparsely-vegetated, silty/sandy riverbanks and lakeshores, usually with species of Subgenus Philochthus or Subgenus Peryphus. Largely south-eastern in Britain (Luff, 1998).